Billions of years in the future, our Sun will become a red giant star. Its diameter will extend beyond the orbit of Venus and likely even Earth. However, there are even larger stars…the supergiants. The constellation Orion (“The Hunter”) contains two well-known stars that are supergiants. In April, Orion is about 35 degrees above the horizon to the southwest just after sunset. 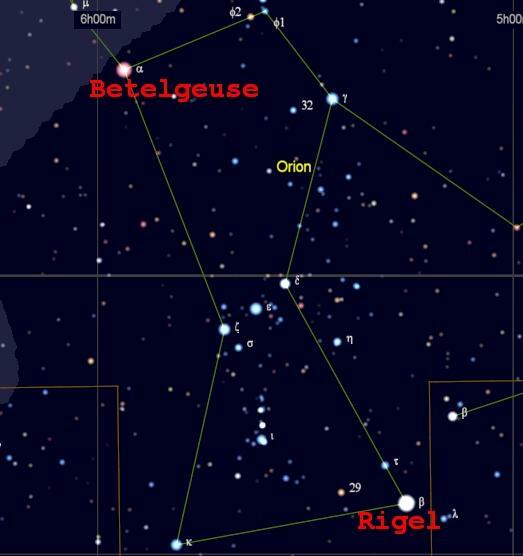 The red supergiant, Betelgeuse, representing Orion’s right shoulder and the blue supergiant, Rigel, representing the left foot are opposite from each other in the figure of The Hunter. Red and blue supergiant stars are at the opposite ends of other characteristics. Red and blue are at opposite ends of the visible light spectrum. Red supergiants have “cool” surface temperatures of 6000 to 8000 degrees F, while blue supergiants have surface temperatures of 20,000 to 90,000 degrees F.
Red and blue supergiant stars have some common characteristics. They are relatively big stars with relatively short lifetimes. They are very bright. The fate of any star depends primarily upon its initial mass, which we measure relative to the mass of the Sun. Stars with an initial mass between 10 and 100 times the Sun burn hydrogen very fast and have relatively short lives, typically only millions of years. These massive stars evolve into supergiant stars, after they have consumed the hydrogen in their cores and start fusing heavier elements. The blue supergiant star, Rigel, is 8-10 million years old and will likely become a supernova in the next 1-5 million years; although we cannot predict this event accurately. In contrast, our Sun is about 4.5 billion years old and has an expected lifetime of 10 billion years. Rigel’s mass is about 23 times the Sun’s mass. The diameter of Rigel is about 80 times the diameter of the Sun. Measuring the size of Betelgeuse is complicated by the presence of several gaseous shells that the star has expelled. Recent best estimates of the diameter indicate if it were at the center of our solar system, it would engulf all the planets out to Jupiter.